Full disclosure, I’m writing this blog in G Suite...however we’re still a blended family seeing as some of our people prefer to use MS Office for their day to day needs. It seems this isn’t unusual either! According to Okta's Business@Work 2016 Report, over 40% of its customers use Google Apps AND Office 365. The truth (and the cloud) shall set you free-which is the biggest benefit of both platforms. Either will let you work from anywhere, anytime, on any device, securely and easily share files with anyone nearly effortlessly. For us, the ability to natively collaborate on a document or a project has been a godsend to our productivity levels because literally, we’re all working on the same page, sometimes at the same time! Both are backed up to the “cloud”, so your data is as “safe as houses”. 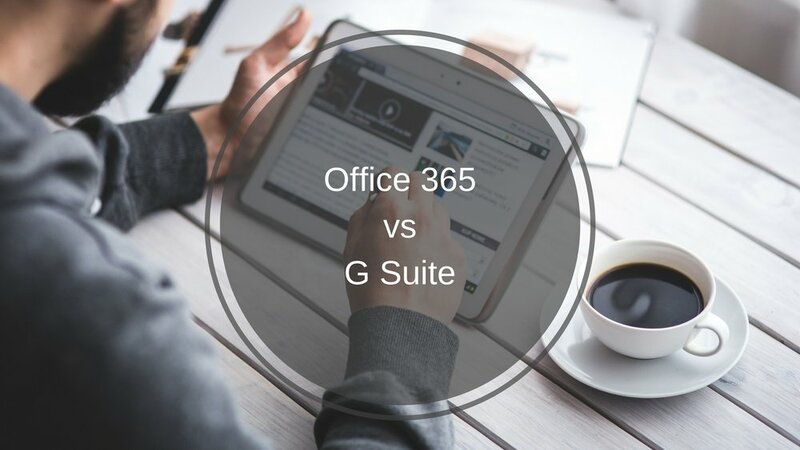 Office 365 is the “market” leader, probably because it has a 20-year head start on G Suite, but interestingly companies under 50 million (tech companies in particular) choose G Suite almost 2 to 1 over Office 365, at least according to my (limited) research. When someone is buying you lunch, you’re on the menu. As in all things, there is a dark side and that is these same companies can see all of your data because you’re storing it on their servers! I just read an article that Walmart is “strongly encouraging” (forcing??) their key suppliers to move cloud-based applications to Microsoft servers, rather than Amazon servers because of their fears of Amazon data mining Walmart’s trade secrets. While Google and Microsoft “promise” they’re not looking at your business data, they are collecting data with every keystroke, file upload, and interaction you have on their systems. This is probably why the most highly regulated industries such as financial and medical are choosing to stay almost exclusively on “private” servers rather than moving everything to Office 365 or G Suite. As my favorite Jedi once said “from a certain point of view” either Office 365 or G Suite is a fantastic choice for business productivity. G Suite is the younger, hipper and definitely the more “open” choice, with a wide range of add-on software available from multiple suppliers, often for free (remember my “free lunch” comment above). Office 365 is the firmly established leader, with unsurpassed security which at times can limit functionality (think of your Dad, it’s my way or the highway).